Offering you the utility of a toolbox for when you need the extra storage. This rail-mounted cargo bag boasts 8 cubic feet of extra storage space. 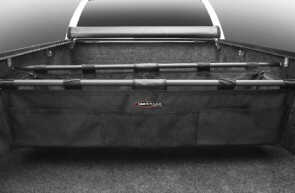 It's easily installed, and fits most truck beds.The weather-resistant cargo bag comes with plastic floor panels and inserts for customizable support and organization, and also sports an open pocket in the front.